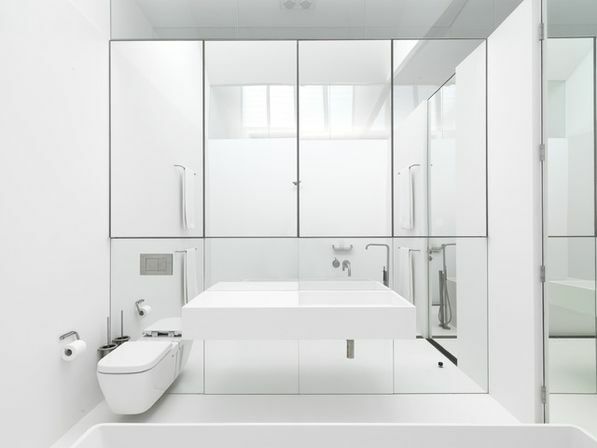 Mirror is essential object which can be found in any bathroom – from palace to a modest studio. That’s why, planning interior of bathroom, it is very important to decide what kind of mirrors you want in there, how they will be situated in the room, how they will be lighted and many other important questions. There are many classifications of bathroom mirrors, accordingly to their style, shape, additional features. Bathroom wall mirrors form the biggest group of bathroom mirrors. Walls provide enough space to hang objects; this way it is possible to save some room space for other furniture and essential bathroom objects as washing machine, sink, bath tub and toilet. Bathroom wall mirror can be secured to a wall by different means – by special fixing elements or by liquid nails and specially purposed glue. It is necessary to choose mirrors, specially designed for bathroom since they are coated with special waterproof formula. 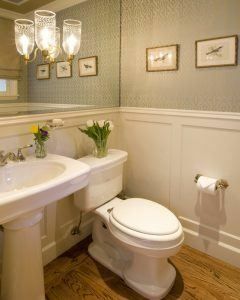 When choosing size of wall mirror, heights of people living there are to put into consideration. Large wall mirror can be a perfect compromise, if there is enough space to accommodate big mirror. If possible it is better to leave a little gap between mirror and a wall, this would let some fresh air to go through it and would prevent appearance of mold. If you want mirror with shelves, it might be useful to choose a model combining lighting as well. 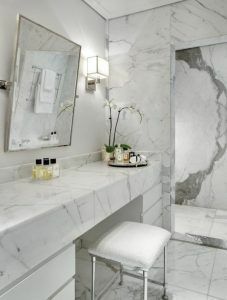 There are some special tricks to visually eliminate some flaws of the room, using power of mirrors. For example, square or rectangular mirrors, placed on the opposite walls, can optically widen the room while elongated wall mirror with shelves can make ceiling appear higher. 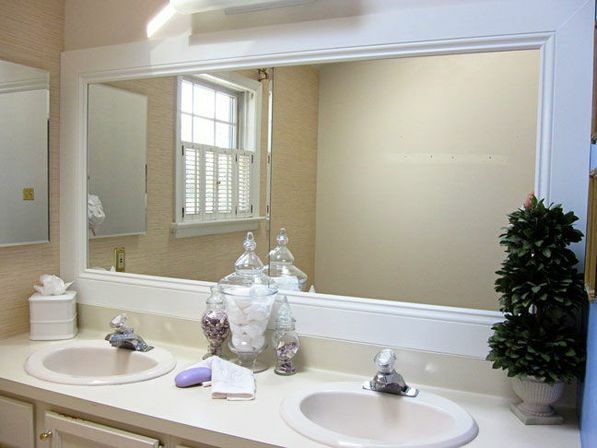 Wall mirrors must be of high quality, which means safe, water-resistant and flawless surface. Safety is crucial when it comes to bathroom. Possibilities of injuring should be eliminated completely. Many mirror manufacturers put on top of mirror surface special protecting film which holds all mirror pieces in case of break. Probability of breaking itself should be very low as good mirrors are made of solid, shock-proof glass. Main function of mirror is correct reflecting of objects. Quality mirror surface is supposed to be at least 4 millimeters thick, should not be curved, scratched or damaged in any other way. Before buying a mirror, you can easily test it. To do so, you need to take a pencil and wave it quickly left and right – good even mirror would reflect it without any delay or distortion. 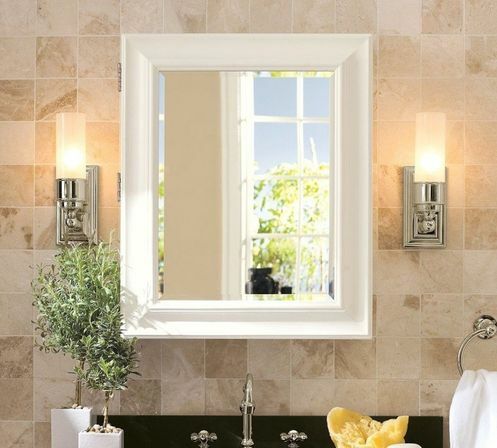 Bathroom wall mirror should be specially designed for using in hot steamy environment. Such special mirrors are made of waterproof materials or coated with special water-resistant base afterwards. Different wall mirrors for different interiors. In special departments of supermarkets, furniture stores and on-line shops a wide range of wall mirrors for bathroom can be found. 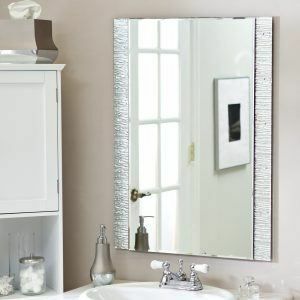 Choosing mirror for bathroom wall, many different aspects are to be considered. Size and layout of bathroom, design idea, personal taste and habits, budget – here is incomplete list of things to be thought about. Following classifications and tips can guide you through this difficult choice. Plain medium-sized wall mirrors for bathroom It is a smart budget option for minimalistic, modern, high-tech interior as well as for bathrooms with no particular design. 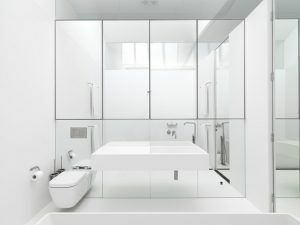 This option is an optimal solution if you need temporary mirror or if according to bathroom plan mirror doesn’t play important role in whole interior concept. Main advantage of this kind of mirrors is a good balance between quality and cost: it does the job and is totally affordable. Mirrors can be with or without frames and of different shapes – square, rectangular, round-shaped, oval-shaped, asymmetrical. Good choice of such basic mirrors can be found, for instance, in IKEA and some on-line stores. Bathroom wall mirror with shelf. Shelf is what really makes main difference from previous type. Very basic and budget by its nature, this mirror allows conveniently organizing some toiletries and cosmetics. This option does not take much space and helps to prevent cluttering of countertops which can be very useful for small bathrooms. Most wall mirrors with shelves are designed in very laconic style – frameless square, rectangular, round-shaped, oval-shaped or asymmetrical mirror with transparent glass shelf or several shelves. 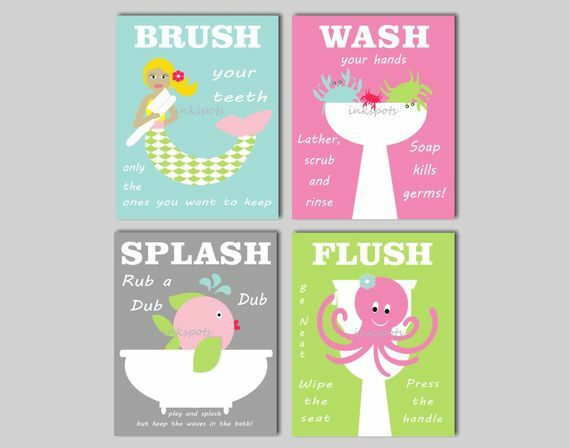 Thus, they fit well into contemporary minimalistic bathroom interiors. Some of mirrors, though, might be quite elegant. Asymmetrical layout of shelves gives a certain modern charm and is perfect for hi-tech, loft and minimalistic bathroom interiors. Modifications with several shelves can be very handy if several persons use one bathroom – each one of them can keep his or her toiletries on separate shelf. 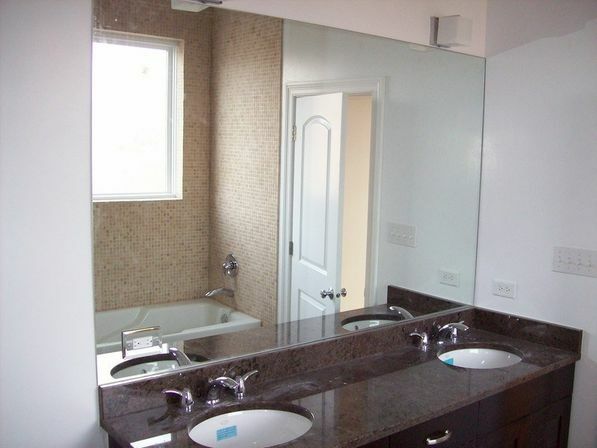 Bathroom mirror wall cabinets are even more convenient than wall bathroom mirror with shelf. This is actually a functional piece of furniture, combining mirror with place for storage. Cabinet allows keeping cosmetics, detergents and other necessities well organized on its inner shelves, away from the eyes. Some models combine closed cabinets, hidden behind mirrored doors, with some open shelves. There are even some mirror cabinet modifications with lock on the doors. Bathroom mirror wall cabinets can be standard-fitted or corner-fitted. Corner-fitted wall mirror cabinet occupies less space than regular one and also makes room appear larger due to mirror in the corner, which is really valuable for small standard bathrooms. Bathroom mirror cabinets are often launched by manufacturers along with other pieces of bathroom furniture so it is easy to pick items from one line, matching by colors and style. This is a practical solution for small standard bathrooms and for all contemporary interiors. Most of bathroom mirror wall cabinets come in neutral colors with one or two mirrored doors. Every wall mirror needs lighting. Lighting should provide clear visibility, enough to apply makeup or to shave flawlessly; it should lighten face evenly without casting rough shadows. 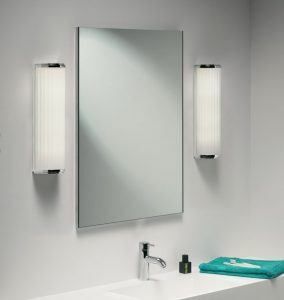 Lighted bathroom wall mirror is convenient piece of furniture with built-in lighting fixtures. Most popular lighting systems are based on LED strip, fixed either on mirror surface or along its contour. Buying lighted mirrors spare you trouble of planning lighting system on your own. In lighted mirrors light beam is set in optimal way; LED lamps provide bright yet evenly distributed light; they are easy in use and economical. When LED lamps are fitted on the back side of mirror, light, streaming from behind creates a beautiful effect of floating. Lighted bathroom wall mirror basically includes the same 3 types of mirrors, mentioned above, with added in-built lights. Lighted wall mirrors look very modern and stylish and would fit in most interiors, except for retro-inspired ones. Bathroom mirrors can be of different shape, with or without frame so it is easy to choose the right one for different bathrooms. 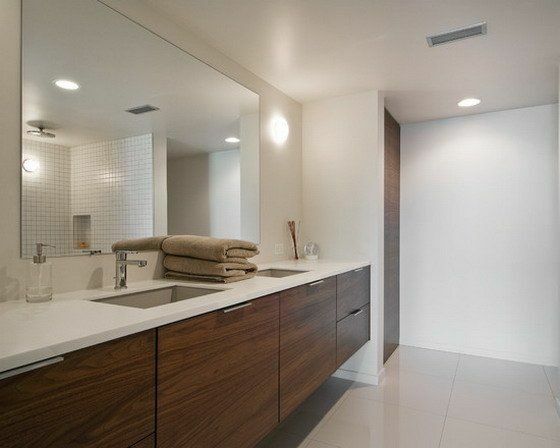 If bathroom is big enough to accommodate large wall mirror, then it is worth investing in it. Large mirror has some serious advantages. It gives a full-height reflection of person which is very handy for getting ready. Large mirror surface, by reflecting light, not only gives bathroom some extra space but also doubles lighting, produced by lamps. Thus, number of light sources can be reduced and some money can be saved. 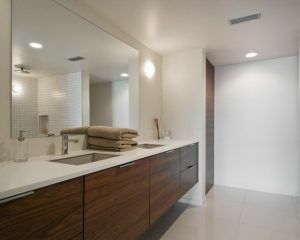 Point lights or LED can be good for modern styled large wall mirror. It is recommended to avoid large wall mirrors on the wall, opposed to the door. Large mirrors can become dominative interior accent. 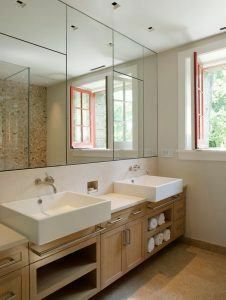 Large oval or rectangular mirrors which belong to different interior styles and eras, help recreating these vibes in bathroom. Wall mirrored elements. Mirrored panels, usually of rectangular shape, are secured on the wall by means of special glue at the same level as wall tiles. This method combines decorating with functionality. Yet another interesting way for bathroom is covering a whole wall with mirrors. Usually wall, opposed to bathing tub or the wall just above bathing tub is used. Such mirror wall can be as well formed out of several mirror cabinets, placed next to each other. Mirrored wall brightens up the room and optically enlarges its space. Decorative mirrors. Being inevitable and highly practical detail of any bathroom, mirrors are very important means of decoration. Wall mirrors can give final stylistic touch to bathroom, adding charm of some exotic continents or different historical periods. One of main ways to express some creative ideas through mirrors is to add some interesting frame. When it comes to frames, it seems as creativity has no limits. There are some classic and baroque oval frames, modern asymmetric frames, made of glass; mosaic frames; enamel frames with different patterns, printed on them. Wooden frames remind us of a summer cottage and show belonging to a country style. Some real works of arts can be found in antique stores. On the other hand, there are millions ideas for handmade frames which would be unique. Mirrors can be of unusual shapes – in the shape of star, for example. Not only frames but mirror surfaces can be decorated – artificially distressed in antique style, for instance. Or small decorative elements as rhinestones can be glued to the mirror. Yet another way of decorating is paining over mirror’s surface. 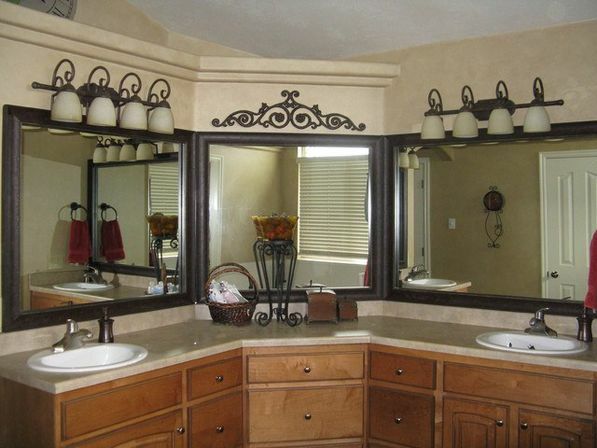 The only rule in choosing or making decorative mirror is that final result is supposed to look tasteful.